No one will remember Brian Pallister’s nearly decade-long career in Ottawa as a backbench Conservative member of the House of Commons as particularly distinguished. Over the course of eight years, Pallister never once served as a minister in former prime minister Stephen Harper’s cabinet. His most pivotal moment, until tonight, may have come in 1998 when, as a rising legislator in Manitoba’s provincial assembly, he waged a challenge for the leadership of the Progressive Conservative Party. He lost handily to former prime minister Joe Clark. Pallister eventually transitioned to federal politics as a legislator for the Canadian Alliance, a more socially conservative and western-based alternative to the Progressive Conservatives — and a party that ultimately effected a merger with the Canadian Alliance in 2003 under Harper’s leadership. Pallister returned to provincial politics in 2012, winning an uncontested leadership bid for Manitoba’s Progressive Conservatives, and for the past four years, that’s meant playing the role of inoffensive alternative to Manitoba’s premier, Greg Selinger, who angered even his own party’s caucus when in April 2013 he reversed a campaign pledge and raised the provincial sales tax from 7% to 8%. 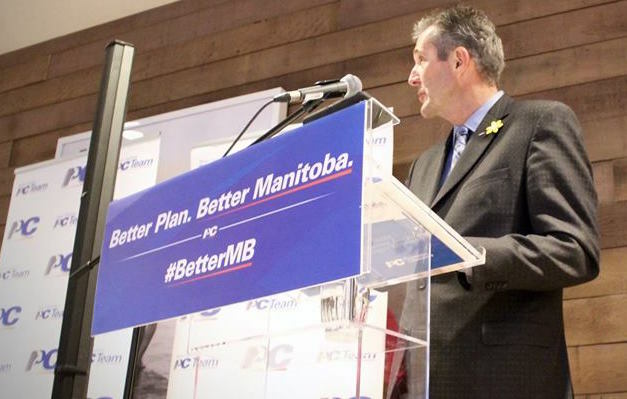 Tonight, however, Pallister becomes the first leader of a provincial Conservative or Progressive Conservative party to win power in the era of prime minister Justin Trudeau. 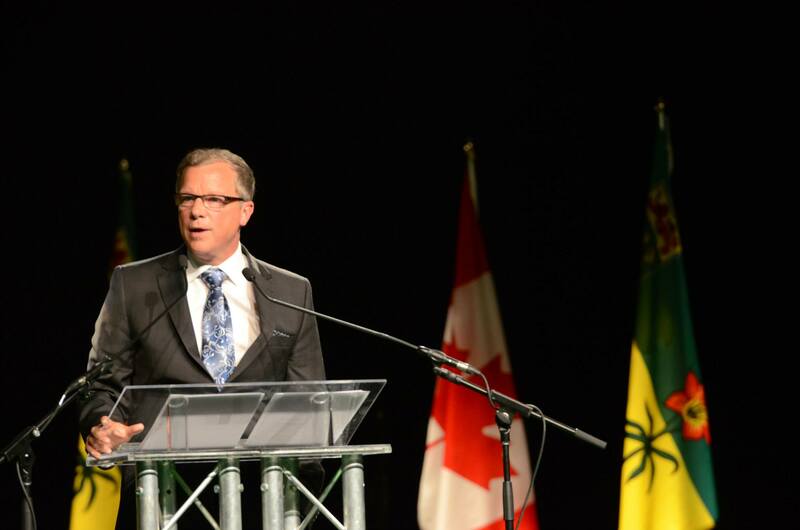 He’ll join another small-c conservative, Brad Wall, who two weeks ago won reelection to a third term as premier of Saskatchewan under the banner of the center-right Saskatchewan Party. He’s bespectacled, he’s boring and he certainly fits a stereotype of a practical prairie square, campaigning across his province in a Chevy pickup truck. 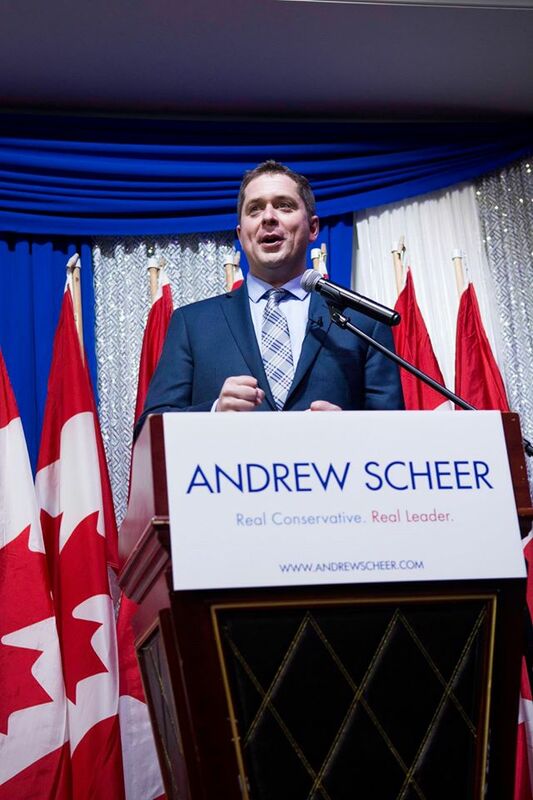 With Liberals ascendant at the federal level and Liberal or leftist governments in power in each of Canada’s other provinces, he leads the only conservative government left across his country. But on Monday, when Saskatchewan voters go to the polls, they are almost certainly reelect Wall and his ‘small-c’ conservative party, the provincial Saskatchewan Party, to a third term — probably by a nearly two-to-one margin over the nearest opponent, the left-leaning New Democratic Party (NDP). Polls give Wall’s party nearly 60% of the vote and with it a chance to retain or even increase its 49-member caucus in Saskatchewan’s 58-member Legislative Assembly. Wall, who consistently ranks as Canada’s most popular premier, is in some ways a throwback to the pragmatic Progressive Conservative Party of the 20th century, a conservative focused squarely on business-friendly policies with a healthy share of humility about government’s ability to effect sweeping change. In his first term, Wall took pains to acknowledge that Saskatchewan’s boom had more to do with global commodity prices than with his own wizardry. Voters, facing the pinch of low oil and gas prices in a province that depends on natural resources, seem willing to give Wall the benefit of the doubt now that Saskatchewan’s economic fortunes are slumping though. In his first two terms, Wall, personally and politically the personification of prudence, deployed $2 billion in revenues, on top of his government’s budget surpluses, into the province’s Growth and Financial Security Fund. Under Wall, Saskatchewan has reversed a population decline — so much so that it’s now attracting residents at some of the highest levels in the county. Wall has also been careful to place Saskatchewan’s priorities over ideological concerns, going out of his way to maintain official neutrality in the last federal election, though it must have been clear to anyone that Wall’s views aligned most naturally with then-prime minister Stephen Harper. Technically speaking, Justin Trudeau belongs to Generation X. But you’d be excused for mistaking him for a Millennial because Trudeau is, in essence, the world’s first Millennial leader. In many respects he epitomizes the “it’s all about me” generation and its self-expression and promotion via social media. So let’s like him on Facebook, follow him on Twitter – and while we’re at it, why not a selfie? What the 73-year-old Manning, who once led his party to such a failure that it won fewer seats in the House of Commons than the pro-independence Bloc Québécois, doesn’t realize is that social media fluency in the politics of the 2010s is currency. It’s a feature, not a bug. (Just ask Donald Trump, who might single-handedly be reinvigorating Twitter as a medium for political communication). While Trudeau, at 44, might be too old to be a Millennial as a technical matter, he certainly mastered the political vocabulary of young voters. Twenty years ago, younger Canadian voters might have viewed the New Democratic Party’s Thomas Mulcair as the kind of prudent, centrist leader that would make a superb prime minister. Not in 2015, when young voters swarmed to Trudeau in record numbers, to the dismay of both the NDP and Conservatives. Among the new faces taking power today in Ottawa, perhaps none is more important to prime minister Justin Trudeau’s success or failure in office than his finance minister, the 53-year-old Bill Morneau, a Bay Street executive who was only just elected to parliament for the first time in 2015. Morneau’s announcement as finance minister was the most consequential of many key personnel decisions announced this morning when Trudeau was sworn in as Canada’s 23rd prime minister, taking a job that his father, Pierre Trudeau, held from 1968 to 1979 and again from 1980 to 1984. 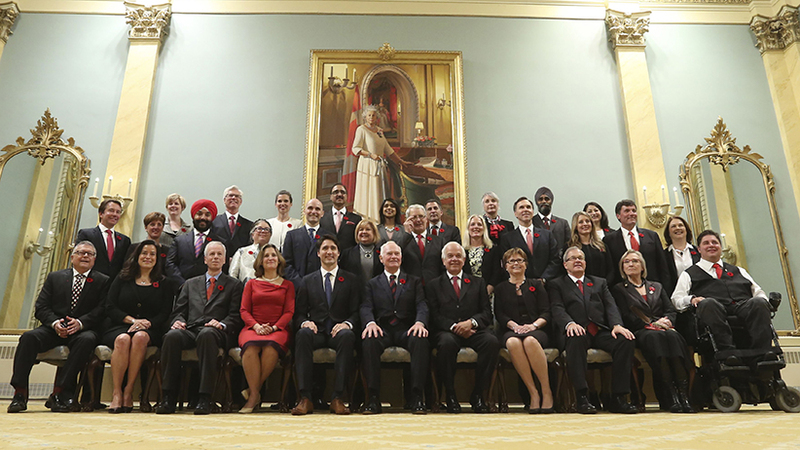 Justin Trudeau’s cabinet is smaller than the outgoing cabinet and, with 31 members, it is comprised of 16 men and 15 women and includes someone from every province (and the territory of Nunavut). 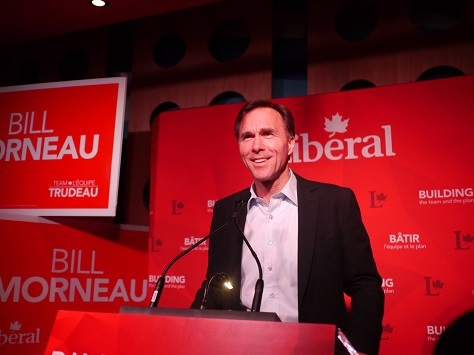 A rookie MP elected for the first time on October 19 from the Toronto Centre riding, Morneau comes to the finance ministry as the former head of Morneau Shepell, Canada’s largest human resources firm (and a firm founded by Morneau’s father) and as the former chair of the C.D. Howe Institute, a relatively centrist economics think tank based in Toronto. In 2014, he was part of a panel appointed by Kathleen Wynne, Ontario’s Liberal premier, to examine her plan to introduce an Ontario-based pension plan that supplements the federal pension plan. Trudeau, whose Liberals were languishing in third place in most polls all summer long, gained traction among voters when he pledged in September that, in he face of a recession across the country, his government would pursue a more expansionary fiscal policy to develop infrastructure and boost demand for jobs — including taking on $25 billion in debt for three years before a return to balanced budgets in 2019-20. For a country where fiscal restraint has been gospel, not only for the past nine years of Conservative prime minister Stephen Harper’s government, but throughout the preceding 13 years of Liberal rule under Jean Chrétien and Paul Martin, promising to engage openly in deficit spending might have been a risky move. Instead, it galvanized centrist and left-of-center voters that had previously been split between the Liberals and the New Democratic Party (NDP). 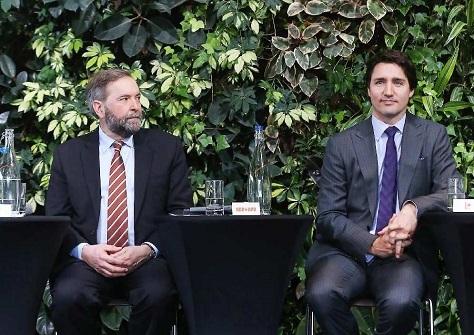 With NDP leader Thomas Mulcair pledging balanced budgets in what would have been Canada’s first NDP-led government, Trudeau’s bold policy stand in favor of deficit spending convinced voters that the Liberals represented the more convincing agents of change. Trudeau, earlier in the campaign, promised to implement a modest tax increase on Canadians who earn more than $200,000 annually and a modest tax cut for middle-class Canadians. Morneau’s most important task as finance minister will be finding a way to translate Trudeau’s plan into an actionable budget. But as a former businessmen with ties to Bay Street, Morneau is a natural choice to assuage the fears of Canada’s business community, and his status as a novice politician brings an element of new blood to a cabinet that has both old and new faces. Morneau’s selection is also a victory for Wynne, who was a vocal supporter of the federal Liberal Party and of Trudeau’s campaign. Wynne often clashed with Harper, who essentially instructed his government in Ottawa not to cooperate with the pension supplement plan that Wynne pushed through Ontario’s legislative assembly last year. He joins a growing group of rookie finance minster with more experience in the private sector than in parliamentary or governmental circles, including Greece’s Yanis Varoufakis, the Czech Republic’s Andrej Babiš and Israel’s Yair Lapid. Morneau will also have a hand in several hot-button issues that will affect the Canadian economy, including relations with the United States, a decision about whether the trans-Canadian Energy East pipeline should proceed and finalizing the terms of the Trans-Pacific Partnership, the 12-country free trade pact linking North America, South America and East Asia. One of those is Scott Brison, who will be the next president of the Treasury Board. In that role, Brison will work very closely with Morneau as a behind-the-scenes official in charge of running much of the Canadian government. If Morneau is tasked with selling the Trudeau government’s economic policy, it will be Brison who is largely responsible for carrying it all out– and then some. Brison, born and raised in Nova Scotia, has been an MP since 1997, is openly gay, began his career as an investment banker, and he started off in politics as a rising star in the center-right Progressive Conservative Party. He’s only 48 years old, is known to be a close personal friend of Mark Carney, the former governor of the Bank of Canada who, in 2013, became the governor of the Bank of England. 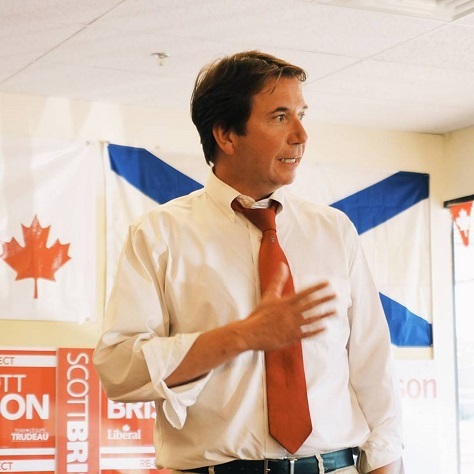 Brison was one of five candidates in the 2003 Progressive Conservative leadership race, though he was eliminated on the second ballot when Jim Prentice (a short-lived Alberta premier, former environmental minister and Harper consigliere) outpaced him by three votes. Just days after the Progressive Conservatives voted to merge themselves into Harper’s more dominant, western-based Canadian Alliance to form the Conservative Party of Canada, Brison switched parties. Within months, then-prime minister Paul Martin had already appointed Brison to the cabinet as public works minister. Brison, who ran for and lost the Liberal leadership election in 2006, has served as the Liberal’s chief finance critic, a role he’s often used to attack Conservative budgets with caustic energy, and he heartily supported Trudeau’s near-coronation to the leadership in 2013. Stéphane Dion, who authored the Clarity Act in 2000 that sets forth the terms of any future secession referendum in Canada, and who garnered international headlines as Canada’s activist environmental minister (who once named his dog Kyoto), led the Liberals to disastrous result in the 2008 election after a merciless campaign that saw his professorial manner dismissed as not “prime ministerial enough” and his English language skills savaged in the media. 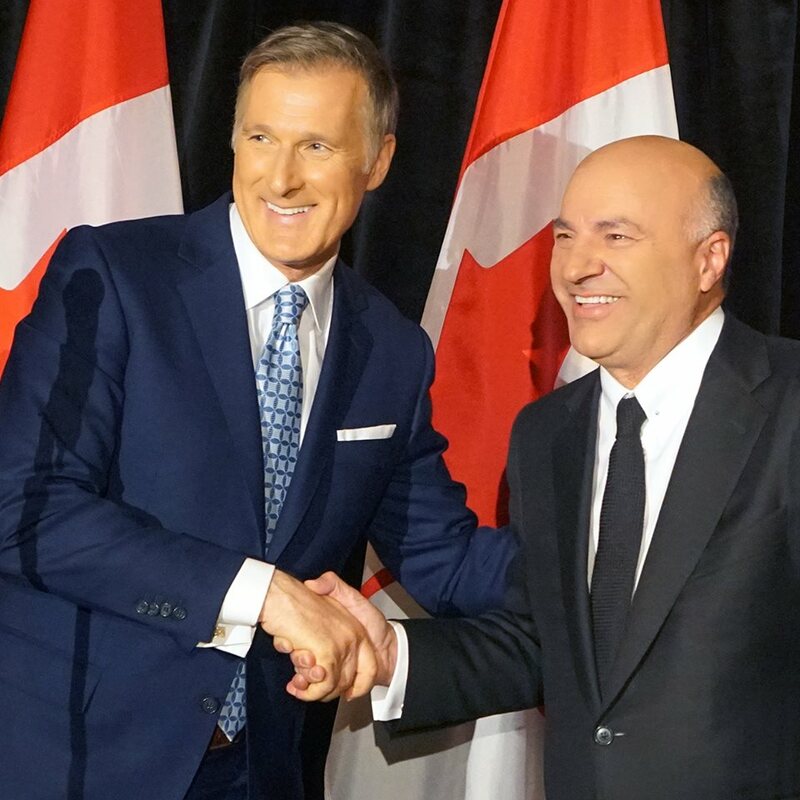 But Dion is a serious parliamentarian who has much to offer the next government and, as a former leader, he follows in the footsteps of former British Conservative leader William Hague, former French prime minister Alain Juppé and even US secretary of state John Kerry as a foreign affairs minister. His first test will come later this month at the Paris climate change conference, where he will join a Canadian government now much more engaged than the previous Harper government on climate change. Dion is suited like a glove for the event, but he will also bring thoughtful and diligent experience of nearly 20 years of government service to Trudeau’s cabinet. Harjit Sajjan, the newly elected MP for Vancouver South is, like Morneau, a newcomer to the House of Commons, to say nothing of ministerial service. 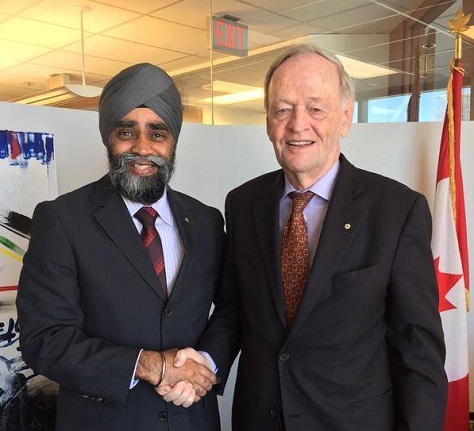 But the Punjab-born Sajjan, who moved to Canada as a five-year-old, will serve as Canada’s first Sikh defence minister after three tours of duty in Afghanistan and a military career as a highly decorated veteran. Sajjan defeated Conservative incumbent Wai Young to take the riding in October, a riding once held by former British Columbia premier Ujjal Dosanjh and home to one of the largest immigration populations in the country, including many Indian Canadians and Chinese Canadians. After his military career, where he reached the rank of lieutenant-colonel, Sajjan served as a Vancouver police officer. Marc Garneau, a Montreal-based MP since 2008, was once himself considered leadership material, and he waged his own campaign in 2013 (stepped down as Trudeau’s inevitability became apparent). The first canadian in outerspace, Garneau served as the president of the Canadian Space Agency from 2001 to 2006 before turning to politics. 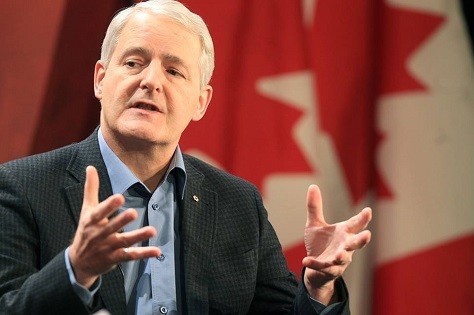 As transport minister, he will face more policy issues about trains and highways than about space shuttles, but with infrastructure spending tops on the Trudeau agenda, Garneau could play an important role in choosing the projects to prioritize and administering those projects. 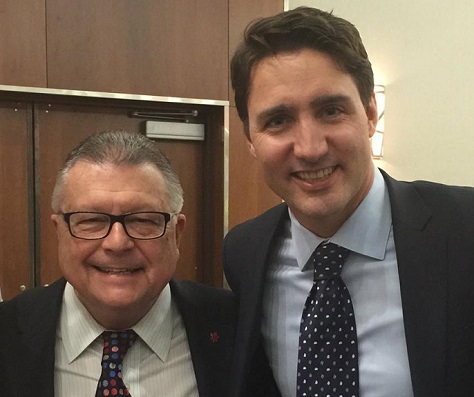 Ralph Goodale, who last served as Liberal finance minister in Paul Martin’s government between 2003 and 2006, was first elected as prime minister in 1974 when Trudeau’s father, Pierre Trudeau, was prime minister. He lost his bid for reelection in 1989 and turned to provincial politics as the leader of the Saskatchewan Liberal Party, a venture that saw little success. Returning to parliament in 1993, he served as one of the Liberal’s most prominent westerners in government as agriculture minister, natural resources minister and public works minister before his elevation to the finance ministry. At age 66, Goodale joins Dion as one of the most experienced members of the Trudeau cabinet. LIke Garneau, the incoming public works minister will work to identity and administer the infrastructure spending that Trudeau wants to use to juice the Canadian economy back out of recession. A writer, former deputy editor of The Globe and Mail and a former managing director and editor of Thomson Reuters, Chrystia Freeland returned from a promising journalistic career in New York to run in a by-election in Toronto to replace Bob Rae two years ago, the retiring interim leader of the Liberal Party. 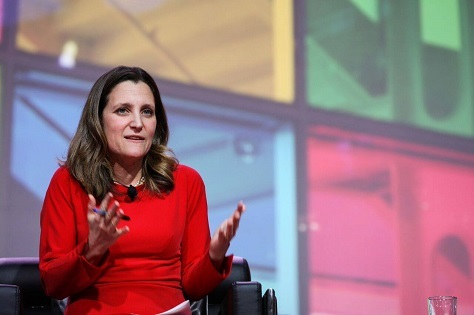 Freeland, who easily won reelection in October, is a proponent of free trade and, presumably, as minister of international trade, will work with Trudeau to implement the Trans-Pacific Partnership just weeks after Harper’s government signed the landmark trade accord. Though Trudeau hasn’t fully endorsed the TPP, he made it very clear throughout the campaign that the Liberal government would be friendly to free-trade accords. Nowhere does Liberal policy shift more fully from the Harper era than on the environment and climate change. 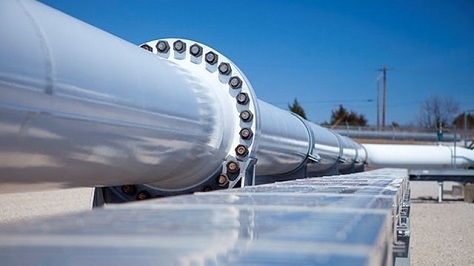 Beyond the Paris conference, the next Canadian government will have a handful of decisions to make about a handful of energy pipelines, including the transcontinental Energy East pipeline. The 44-year-old McKenna, with a career as a human rights attorney, is also a newcomer to parliament, winning her riding in Ottawa Centre for the first time last month. Dominic LeBlanc, who has represented the Beauséjour riding from New Brunswick since 2000, is only three years older than McKenna, but he might be among the most knowledgeable Liberal ministers about how to navigate government. The son of former senator and governor-general Roméo LeBlanc, Canada’s new leader of the House has been friends with Trudeau since childhood, and he has long been a key adviser to the new prime minister. Though he’ll be one of the highest-ranking cabinet officials from Atlantic Canada, he is also very much Trudeau’s man in the House of Commons. Next week, for the first time since 2002, Stephen Harper will neither be Canada’s prime minister nor opposition leader. At the same time that Stephen Harper was on stage conceding defeat to Liberal leader Justin Trudeau, he announced (via a statement) that he would indeed be stepping down as leader of the Conservative Party, a position that he has held since 2003 when the party first came into being. In the days ahead, the Conservative Party will decide how to appoint a caretaker interim leader pending a full leadership election to choose the party’s second leader. Harper leaves behind a mixed legacy, like any prime minister. For Canada’s conservatives, Harper wasn’t just a three-term prime minister, though his nine-year tenure will be longer than all but five prime ministers in Canadian history. 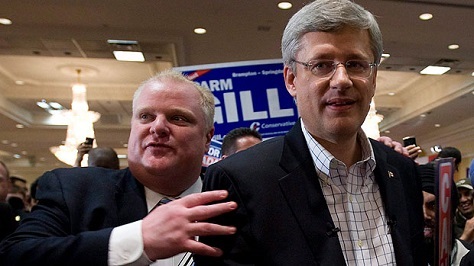 He’s the tribune who led the Canadian right out of the wilderness of opposition and the man who brought the Canadian west back into the national conversation that had focused too long on Toronto commercial matters, constitutional crises, bilingualism and appeasing the Quebeckers. In retrospect, it’s amazing that it took just three years for Harper to take power after engineering the December 2003 merger between his Canadian Alliance, the upstart prairie and western movement that brought a more full-throated, US-style, socially conservative attitude to national politics, and the more troubled Progressive Conservative Party. By the 2000s, the PCs were a relic of the eastern elite, and the party never fully recovered from the 1993 election, when it lost all but two seats in the House of Commons. Incredibly, as the Conservative Party looks to choose Harper’s successor in the weeks and months ahead, he is the only leader that the current Conservative Party has known — not counting, of course, the two living former Tory prime ministers Joe Clark and Brian Mulroney, neither of whom ever completely warmed to the Calgarian warrior from the west. At just 56 years old, Harper certainly didn’t look or act like a leader (or prime minister) in a hurry for retirement. He looked mostly like someone who believed, until too late, that leftist and moderate voters would split between the Liberals and the New Democratic Party (NDP), giving the Conservatives yet another path to government by plurality vote. To his misfortune (and to the NDP’s), that didn’t happen. Post-election reports reveal that Harper was considering a pledge not to seek a fifth term after 2015. But having only won his first majority government in 2011, Harper might have easily stuck around to run for a fifth mandate if he’d survived October 19. But in shooting for a fourth consecutive term, Harper knew well that he was facing long odds attempting to repeat what only Conservative John Macdonald and Liberal Wilfrid Laurier accomplished before. 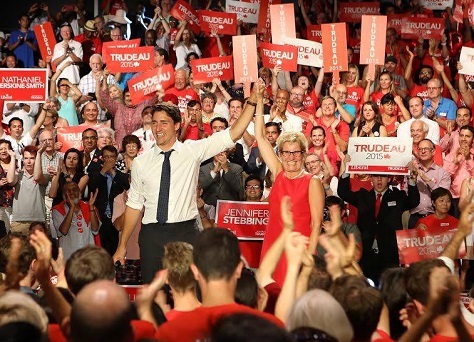 Defying expectations in August that pitted the Liberal Party in third place at the beginning of the election campaign in August, Justin Trudeau has now won a clear majority government and a mandate for change in Canada’s 42nd federal election. So what does that mean for Canada, for US-Canadian relations and for Canada’s role in the world in the weeks and months ahead? Here are nine policy areas to keep an eye on as Trudeau begins the rapid transition to 24 Sussex Drive, appoints a cabinet and tackles a full agenda of issues that could dominate what will likely be a full four-year term with the kind of parliamentary mandate that should make it much more easier than Trudeau ever expected to enact his policy preferences. Climate change. As the Paris summit on climate change approaches in November, Canada’s government will go from being one of the most skeptical participants at the conference to one of the most enthusiastic supporters of action to reduce carbon emissions. 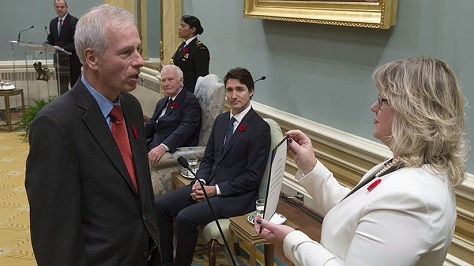 Keep an eye on Stéphane Dion, the former Liberal leader from 2006 and 2008 and a former environmental minister, to play a vocal and supportive role. Nevertheless, global climate change policy is mostly set by the G-2 — i.e., the United States and China. 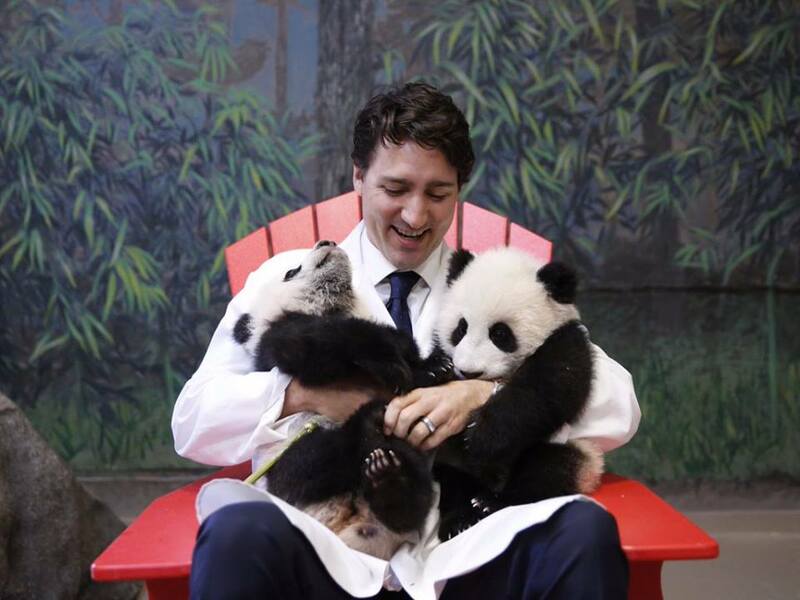 So Trudeau’s role at the summit, while productive, will be more about style than any actual substance. 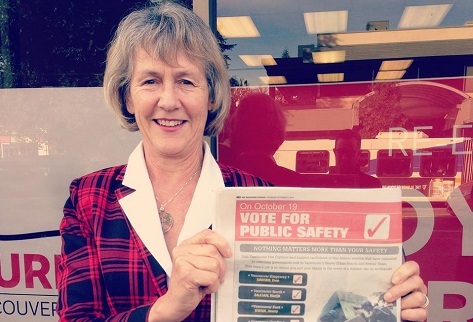 Joyce Murray, a popular left-wing MP and British Columbia’s former environmental minister, who was the runner-up to Trudeau in the 2013 Liberal contest, is also a rising star to watch on environmental matters. Economic policy. At the start of the campaign, the traditionally more centrist Liberals advanced a tax policy to the left of the New Democratic Party (NDP) by promising a middle-class tax cut to be paid for by slightly higher taxes on those who earn roughly more $200,000 annually. During the campaign, as Canada officially slipped into a shallow recession, Trudeau doubled-down by pledging to engage in deficit spending over the next three years to stabilize Canada’s economy, protect jobs and boost infrastructure. It was this move, again outflanking the NDP (whose leader Thomas Mulcair promised to maintain the Conservative Party’s devotion to balanced budgets), that may have convinced voters that Trudeau, and not Mulcair, represented the most striking contrast with Conservative prime minister Stephen Harper. Will Justin Trudeau and the Liberal Party win a majority government or a minority government? 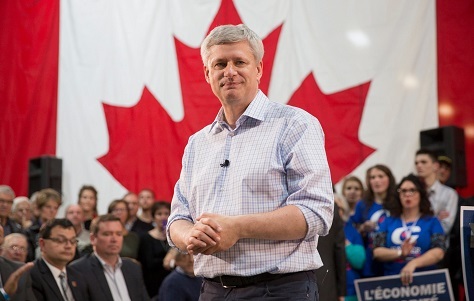 Will prime minister Stephen Harper’s Conservatives emerge with the largest number of seats? How far could the New Democratic Party fall? Join Suffragio at 8 p.m. 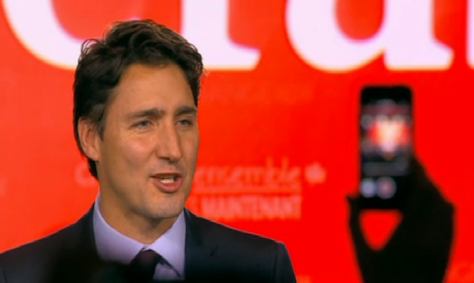 ET for live analysis of the 42nd Canadian federal election. 1:25 am. It’s time to wrap things up here on the East Coast. 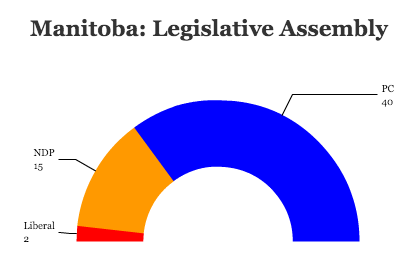 Some of the final numbers might yet change, but the live blog will end with the latest numbers — both in terms of vote share and the seats of the House of Commons. 1:15 am. 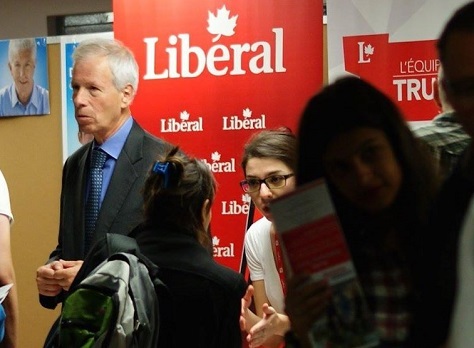 Another Liberal grandee worth watching is Stéphane Dion (pictured above), who unexpectedly won the Liberal leadership in 2006 after Paul Martin’s election defeat. Dion, a former environmental minister and intergovernmental affairs minister, easily won reelection in his Montreal-based riding. 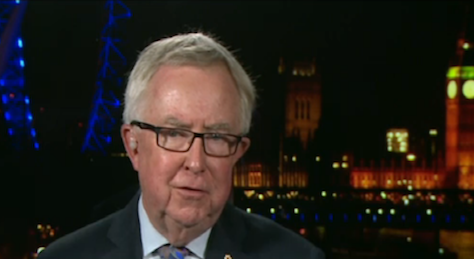 He’s one of the few remaining links not only to the Martin frontbench but to the Chrétien frontbench. It’s nearly certain that he will play some high-profile role, at least initially, in the Trudeau government — especially with the high-stakes climate change summit in Paris approaching next month. 1:01 am. 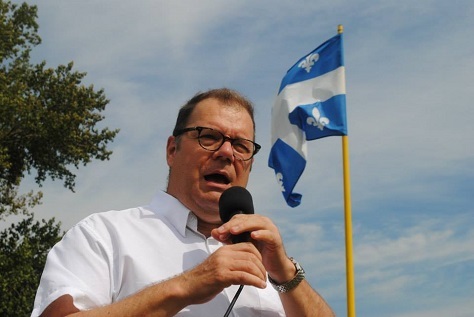 Ironically, Bloc hardliner Mario Beaulieu (pictured above), whose year-long leadership proved so disastrous, was elected from his La Pointe-de-l’Île riding tonight, pushing the NDP into a narrow third place. 12:51 am. One of the people to watch in the next Liberal government is Joyce Murray, the runner-up to Trudeau in the 2013 election. An MP from Vancouver, Murray has taken a much more conciliatory approach to the NDP and the Green Party. 12:41 am. 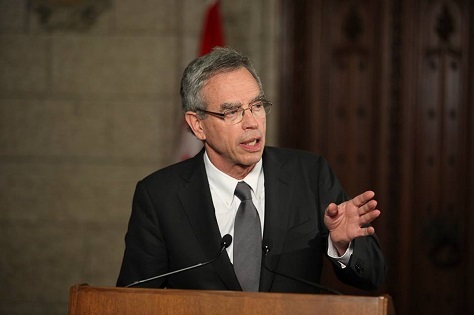 CBC has now called the riding of Eglinton-Lawrence in Toronto for Marco Mendicino, who will defeat the outgoing Conservative finance minister Joe Oliver (pictured above). That removes yet another potential leadership contender and a potential interim leader. 12:35 am. Not to take anything away from the massively impressive Liberal victory, but this isn’t the best speech I’ve ever heard, even from Trudeau. It’s rambling, and phrases like ‘a Canadian is a Canadian is a Canadian’ do not project the kind of gravitas that he will need to demonstrate in the two-week transition to 24 Sussex Drive. But note that the niqab wasn’t a complete loser for Harper, especially in Quebec, where the Conservatives will double their seats to 10 and where the Bloc will also make gains. I fear that this story isn’t over yet. 12:14 am. Trudeau takes a victory lap against the sometimes harsh personal campaign that his opponents ran against him: ‘This is what positive politics can do, this is what a positive, hopeful vision and a platform and a team together can make happen.’ It’s sort of spiking the ball against Harper and even Mulcair for the patronizing attitude that they took against Trudeau’s inexperience. Trudeau has been an MP only since 2008, and he won the Liberal leadership just five years later. The Conservatives ran ads openly asking whether Trudeau was up to the job, and Mulcair often criticized ‘Justin’ in patronizing terms, at times, in the campaign’s leadership debates. One of the reasons why it’s so hard to predict the results of tonight’s federal election in Canada is the diversity of political views across a country that contains 10 provinces and three territories across over 3.85 million square miles. By the time the last polls close at 7 p.m. Pacific time, we may already have a good idea of who will lead Canada’s next government. Or we may be waiting into the wee hours of the morning as results from several hotly contested British Columbia ridings. With plenty of three-way races pitting the Conservative Party of prime minister Stephen Harper against both the Liberal Party of Justin Trudeau and the New Democratic Party (NDP) of opposition leader Thomas Mulcair, there’s room for plenty of fluidity on a riding-by-riding basis. 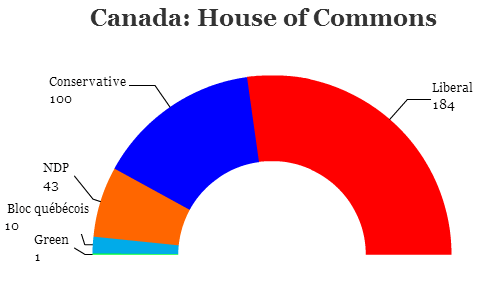 The contest is even less predictable because it’s the first election to feature an expanded House of Commons that will grow from 308 to 338 seats. All of this means that as returns come in, it’s important to know what to expect from each region of Canada, where political views vary widely. Roughly speaking, there are three plausible outcomes from tonight’s Canadian federal election. 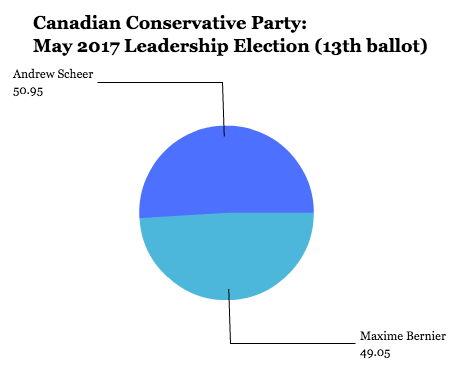 The first, increasingly likely (with a final Globe and Mail poll giving the center-left Liberal Party a lead of 39.1% to just 30.5 for the Conservative Party), is an outright Liberal majority government. 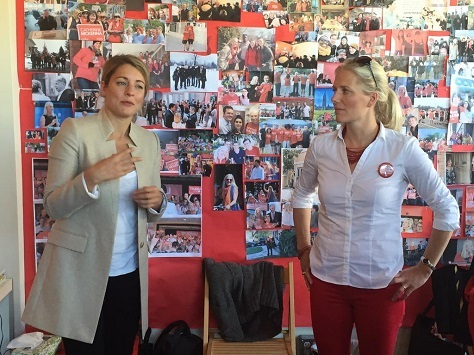 It’s a prospect that no one would have expected a few days ago and certainly not when the campaign began with Liberal leader Justin Trudeau stuck in third place. But as the Liberals have pulled support from the New Democratic Party (NDP) and possibly even from the Conservatives in the final days of the campaign, they just might make it to the 170 seats they’ll need to form a government without external support. The second, increasingly unlikely, is a Conservative win. No one expects prime minister Stephen Harper to win a majority government again nor anything close to the 166 seats he won in the 2011 election (when the number of House of Commons seats was just 308 and not yet the expanded 388). Under this scenario, Harper would boast the largest bloc of MPs, even though an anti-Harper majority of NDP and Liberal legislators would be ready to bring down Harper’s shaky minority government on any given issue. Despite a growing Liberal lead, there’s some uncertainty about the actual result. That’s because Canada’s election is really 338 separate contests all determined on a first-past-the-post basis. In suburban Ontario, throughout British Columbia and in much of Québec, where the NDP is most competitive, left-leaning voters could split between the NDP and the Liberals, giving the Conservatives a path to victory with a much smaller plurality of the vote. (In the waning days of the campaign, several groups have tried to urge strategic voting to make sure the anti-Harper forces coalesce on a riding-by-riding basis). The safest prediction is still a Liberal minority. For a party that currently holds just 34 seats in the House of Commons after former Liberal leader Michael Ignatieff’s 2011 disaster, a plausible increase of 100 seats would be a massive improvement, validating the Liberals’ decision to coronate Trudeau as the party’s last saving grace. Despite the NDP’s loss of support, it is still expected to have some resiliency in British Columbia and Québec. Getting to 170 from 34 might just be a step too far, but it’s certainly no failure if Trudeau falls short in just one election cycle. 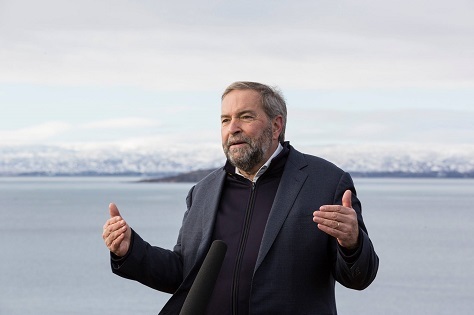 “It’s an old saying that you catch more flies with honey than with vinegar,” Mulcair said. “You are pouring vinegar all over the Americans.” Harper said that he has worked “productively, overall” with Obama and the U.S. during his reign as prime minister. 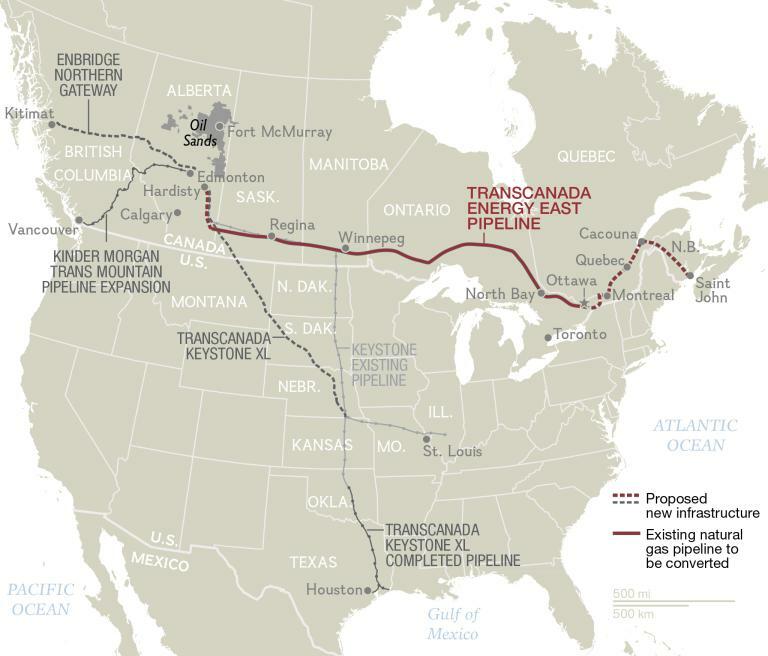 But Keystone XL isn’t the only pipeline matter that the next Canadian government will face. It’s possibly not even the most important pipeline or even the most important issue as Canada prepares to join a crucial global summit on climate change regulations in Paris in November. But for all the accomplishments of prime minister Stephen Harper in the past nine years (lower taxes, attempts at budget surpluses, aggressive pursuit of free trade agreements, a more relaxed attitude to federalism), it might be surprising that such an energy-friendly government of an Albertan prime minister who comes from a Conservative Party with deep roots in the Canadian west hasn’t overseen the full completion of any major pipeline projects. After leading the polls in July, August and much of September, the New Democratic Party (NDP) now seems likely to place third after next Monday’s election. Much of the NDP’s fall is attributable to the corresponding rise of support for the Liberal Party under the leadership of Justin Trudeau, who spent much of the summer languishing in third place. 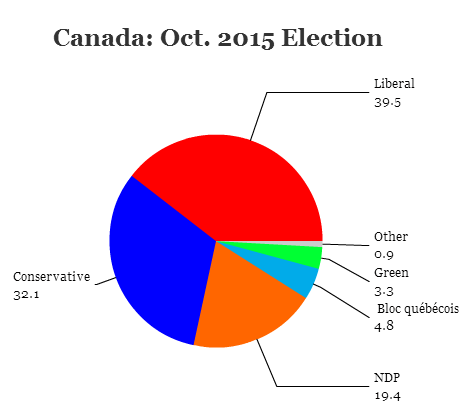 Not so long ago, Mulcair appeared the favorite among Canadian voters to become the next prime minister. Today, however, polls suggest he will not only fall short of government, he’ll fall back from opposition leader to third-party status. How did the NDP end up in such a strong position, as recently as a month ago, and how did it and its leader, Thomas Mulcair, squander such a historic opportunity? Traditionally, the Liberal Party of Canada occupied the great center (and center-left) space of the country’s politics — and it was a recipe that gave the party control of Canada for nearly 70 years in aggregate during the 20th century. In the 21st century, however, the party has struggled to find its voice. In 2004, prime minister Paul Martin lost the party’s majority; in 2006, Stephen Harper’s Conservative Party wrested a minority government from Martin; in 2008, the Conservatives gained while Liberal leader Stéphane Dion lost 18 seats; and, of course, in the 2011 election, the Conservatives finally unlocked a majority government while Dion’s successor, academic Michael Ignatieff lost all but 34 seats in the House of Commons and ceded the official opposition, for the first time in Canadian history, to the traditionally progressive New Democratic Party. 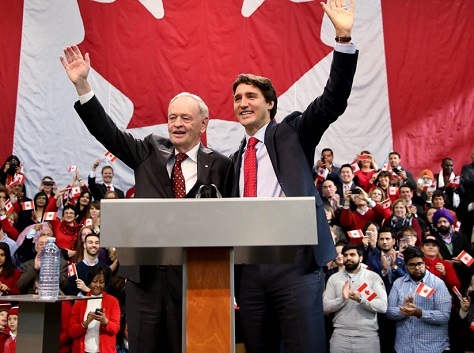 Under Justin Trudeau, the scion of perhaps the most lionized Liberal prime minister of the 20th century, you might have expected the party’s fortunes restored as the natural force of Canadian government. That hasn’t happened, and the NDP, under Thomas Mulcair, is locked in a tight three-way race with Trudeau’s Liberals and Harper’s Conservatives (vying, in the midst of a fresh recession, for a fourth consecutive term). 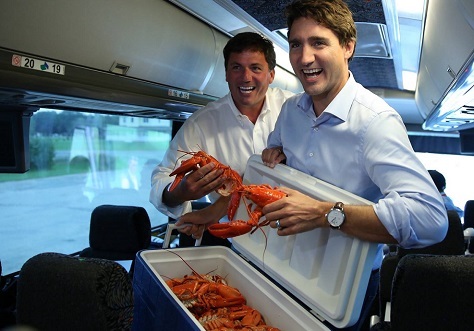 For much of the spring and summer, Trudeau couldn’t seem to get a break. Conservative attacks about Trudeau’s relative inexperience (instinctively reinforced, fairly or not, by his youthful good looks) seemed to gain traction, and the NDP’s surprise win in the Albertan provincial election forced voters to consider Mulcair as a suitable alternative. 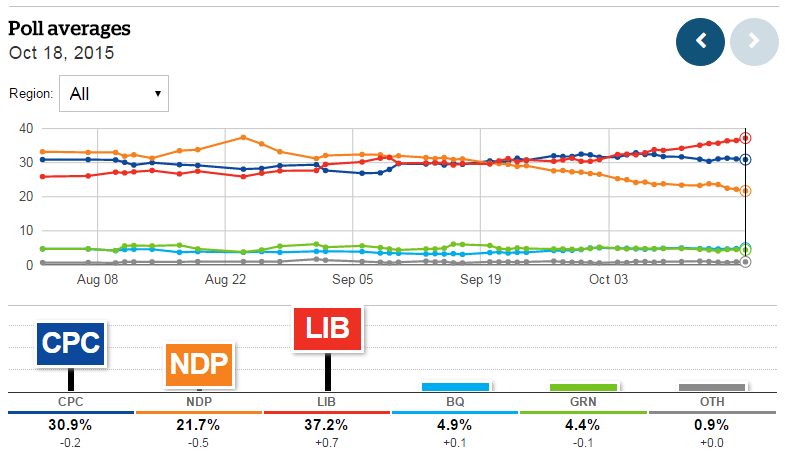 By the end of August, the Liberals were trailing in third place. Trudeau’s support for the Harper government on Bill C-51 (the Anti-Terrorism Act) disappointed leftists as a knee-jerk attack on civil liberties. But that’s changed over the course of the past three weeks and, for the first time since the campaign began, the Liberals have pushed (very, very narrowly) the NDP out of first place in the CBC aggregate poll tracker. 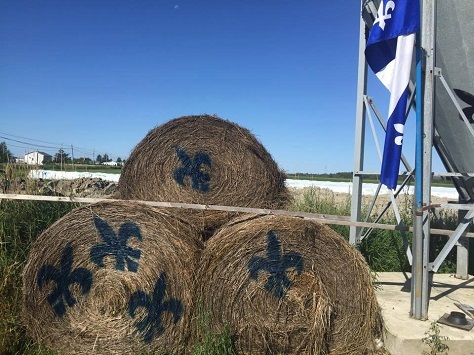 For nearly two decades, the most dominant force in Québec politics was the Bloc québécois, a sidecar vehicle to the province-level Parti québéecois that has fought, more or less, for the French-speaking province’s independence for the better part of a half-century. From 1993 until 2011, the BQ controlled nearly two-thirds of all of Québec’s ridings to the House of Commons. 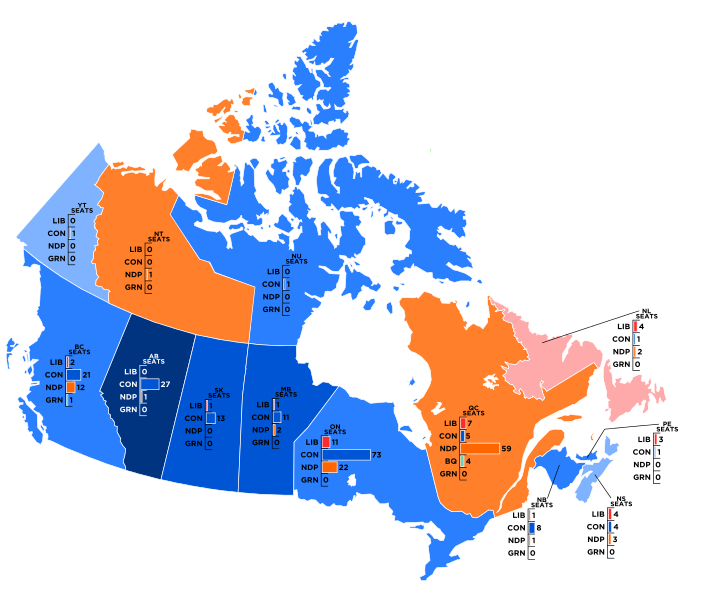 In the mid-1990s, with western and eastern conservatives split, and the Jean Chretién-era Liberal Party dominating national politics, the BQ held the second-highest number of seats in the House of Commons, making the sovereigntist caucus, technically speaking, the official opposition. That all changed in the 2011 election, when the New Democratic Party (NDP) breakthrough made it the second-largest party in the House of Commons. It did so nationally by stealing votes from the Liberals, but it did so in Québec in particular by poaching votes from the Bloc, whose caucus shrank from 47 members to just four. Moreover, as the BQ heads into October’s general election, its caucus has dwindled to just two seats, due to defections, and there’s a good chance that the party will be wiped out completely in 2015. If it is, and the BQ époque firmly ends next month, it could send a chilling lesson to separatist movements throughout the developed world. Most especially, it’s a warning for the Scottish National Party (SNP), which is riding so high today — the SNP controls a majority government in Scotland’s regional assembly and it won 56 out of the region’s 59 seats to the House of Commons in the United Kingdom’s May 2015 general election. But the lesson for the SNP (and other autonomist and separatist parties) may well be that there’s a limit to protest votes, especially if electorates believe that nationalist movements like the SNP or the Bloc can neither extract more concessions from national governments or take part in meaningful power-sharing at the national level. The Bloc‘s collapse in the early 2010s might easily foretell the SNP’s collapse in the 2020s for exactly the same reasons. The return three months ago of the Bloc‘s long-time former leader, Gilles Duceppe (pictured above), was supposed to restore the party’s fortunes. 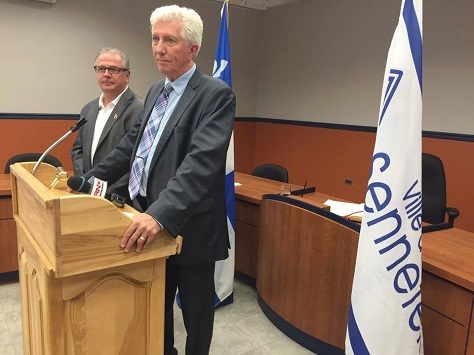 Instead, the 68-year-old Duceppe risks ending his political career with two humiliating defeats as the old and weary face of an independence movement that has little resonance with neither young and increasingly bilingual Quebeckers nor the deluge of immigrants to the province for whom neither French nor English is a first language. Some polls even show that Duceppe will lose a challenge to regain his own seat in the Montréal-based riding of Laurier-Sainte-Marie, where voters preferred the NDP’s Hélène Laverdière in 2011. 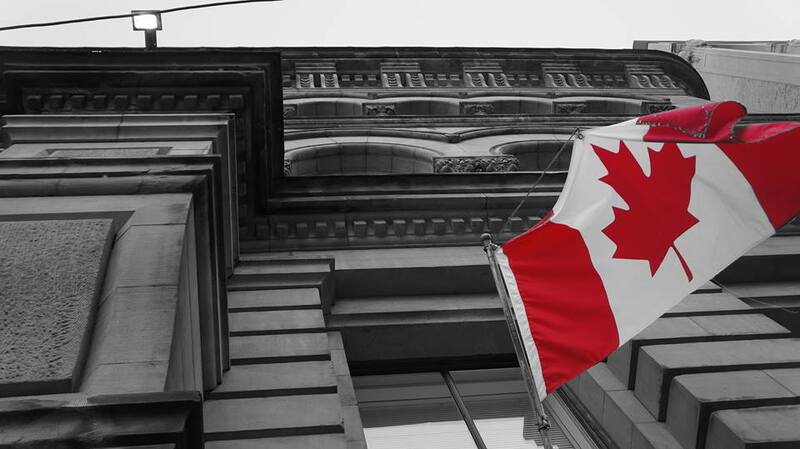 The BQ’s collapse at the national level holds important consequences for Canada’s federal politics. Without the Bloc‘s lock on one-sixth of the House of Commons, it becomes much easier to win a majority government. Even in the event of a hung parliament, though, assembling a majority coalition will still be easier for the three major parties, because none of the Conservatives, the Liberals or the NDP would risk forming a coalition with Québec MPs who want to leave Canada. More importantly, with the Bloc no longer holding so many ridings in Québec, Canada’s second-most populous province, it opened the way for the NDP’s rise in 2011. In retrospect, the NDP’s social democratic roots were always a natural fit for Québec’s chiefly left-of-center electorate. The NDP’s continued strength in Québec in the present campaign means that it is a serious contender to form the next government.